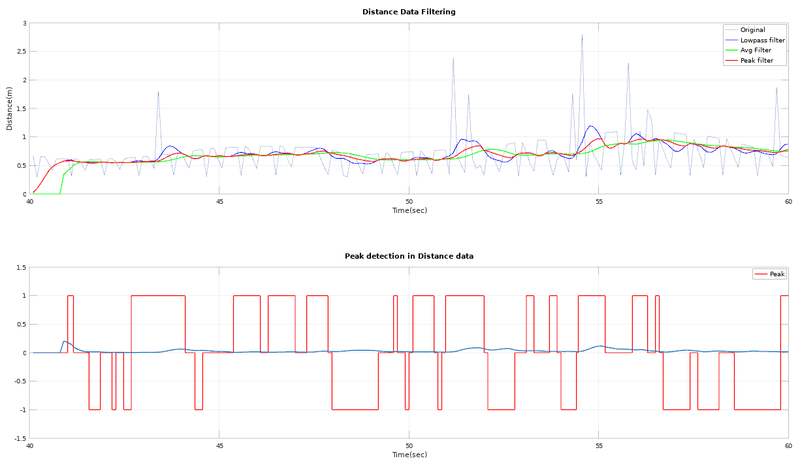 Below is my distance sensor measurement which looks ugly with lots of noise. I just hooked up my maxbotics sonar PWM pin to AUX5 on pixhawk board. 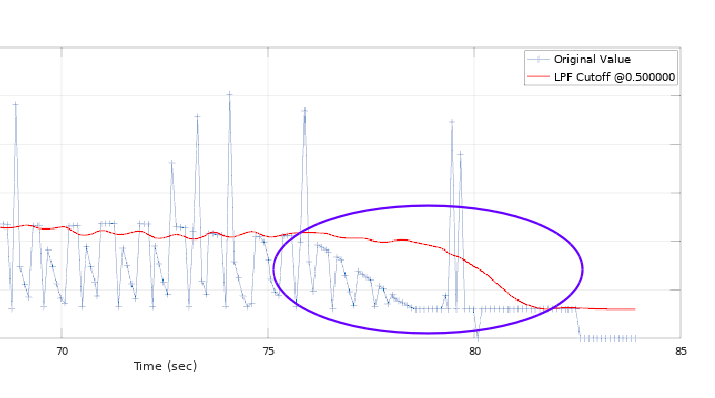 I set ll40ls as pwm to utilize this sensor and this is the result. Looking at the code LidarLitePWM.cpp I see no filtering is going on and just publish as is. Is there a way I can put this data into a pre defined filter or I have to make one. Are you flying over very rough terrain or over a more or less flat surface? I've seen these measurements before e.g. when flying over crops. In that case you need to come up with your own solution for getting the data you are interested. If this is the sensor output over a smooth surface I'd say you have a problem with your sensor. I am flying over flat surface. Maybe I need to change the sensor? Yes, you will have to look at the specs of your sensor but it does indeed not look great. What's the min and max range you need, maybe I can suggest a better sensor? The drone would be mostly fly indoor and within 0.3m to 3m. I know there are lidar sensors works find but our drone is size constrained and anything bigger than max sonar will not fit. But I would appreciate if you can suggest any sensors. Yes, I implemented a moving average filter within the ll40ls pwm driver and got following result. This seem to improve a little but not much improvements in holding the altitude. mc pos control is trying to manipulate pos z setpoint when enabled range sensor aid. To me, flying with only barometer reference is far better than aid with range sensor. This is quite strange behavior. This gives me some idea about applying low pass filter. Now I combined lowpass filter with average filter and give better results as here. I also found in Arducopter that it also takes into account for applying low pass filter for their range sensor as per here. In this line of code, Their cutoff frequency is set to 0.25 which is quite match to the above FFT results. I have an algorithm for my sensor that is similar to this with a bit extra. Essentially what I am suggesting above is imposing a requirement of 3 consecutive measurements that are within a delta of each other before allowing publishing. This ensures that you do not include spurious measurements and it also ensures that the data you are publishing has been stable for at least a little bit. edit: I don't have my code on this computer, I can advise more on monday. But this example is meant to give you an idea of the type of checks you need to implement. Get creative with it, straight math won't solve this problem, gotta use logic. @dakejahl Thank you for sharing such a valuable info. Will take a look tomorrow and see how it works. 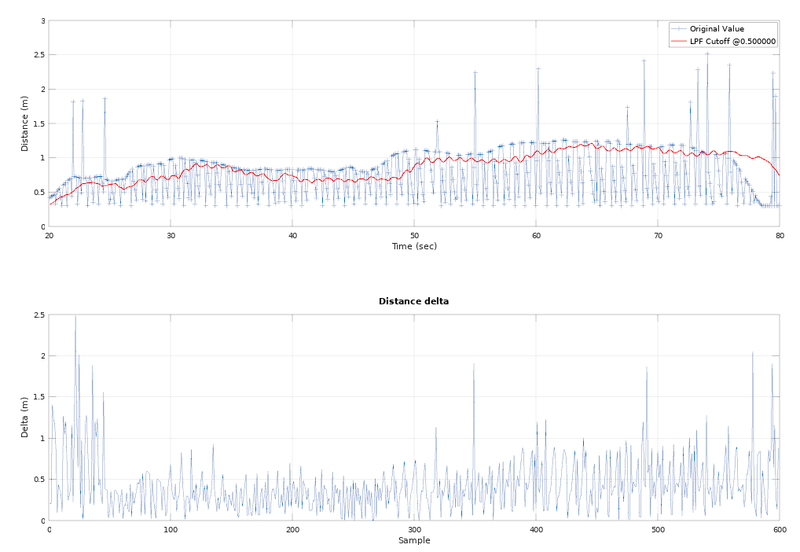 This is a snap shot of the sonar data and distance delta for each sample below. 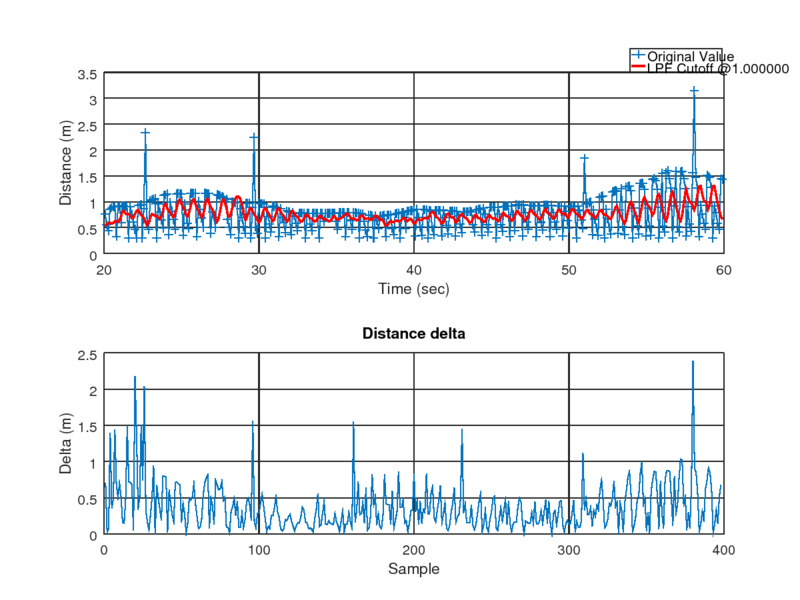 This plot gives me an idea about how much of logical filter needed and I think 0.4m / sampling time would be enough. Now I can get following result. 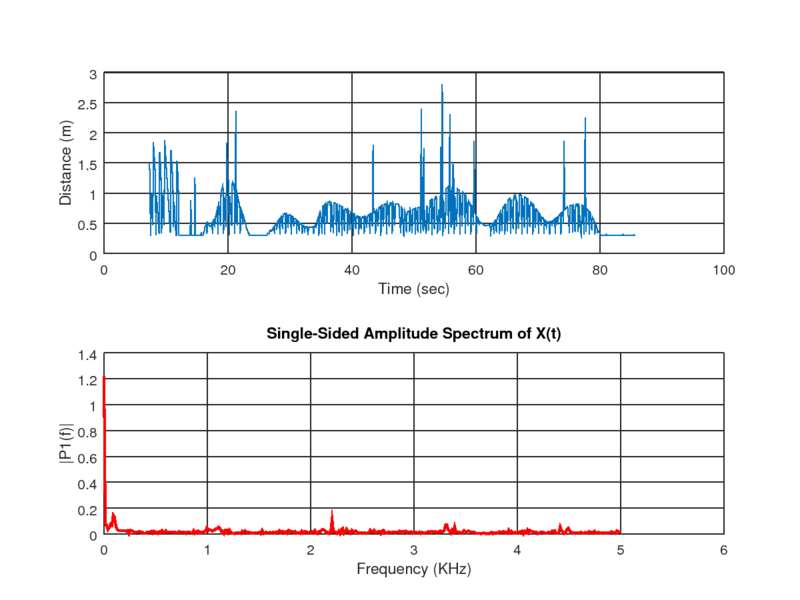 I applied low pass filter with cutoff frequency =0.5Hz. But here is another problem. I still need to figure out why filtered data is about 3 seconds behind the actual data and how to resolve this. Hopefully if this does not bother the overall flying characteristics, I would be fine too. This delay is surprinsing, what kind of LP filter it is? Also to remove outliners, I suggested you to use median filter which is different from average filter. Average filter takes into account every value, and attributes it the same weight. So glitchs will strongly impact your filtered value. While median filter will sort your N previous values and keep the (N/2)th, so extremes values like glitchs will be simply ignored. I am using LowPassFilter implemented inside the math library in PX4 source code. Do you have any reference for implementing median filter you mentioned? PX4 Autopilot Software. Contribute to MattMgn/Firmware development by creating an account on GitHub. Thanks for sharing your work. Actually, the above noise issue was simply solved by replacing sonar sensor with different one. Now I am struggling with other issues. Hello @Kyuhyong_You ! I was curious to know which sonar sensor worked for you. I used sonar came with px4flow not just one but 2 and they all have noise issue. So I just used separate sonar sensor similar to this https://www.digikey.com/product-detail/en/maxbotix-inc/MB1242-000/1863-1010-ND/7896782 and it works great. Not sure if it relates to power issue or not.